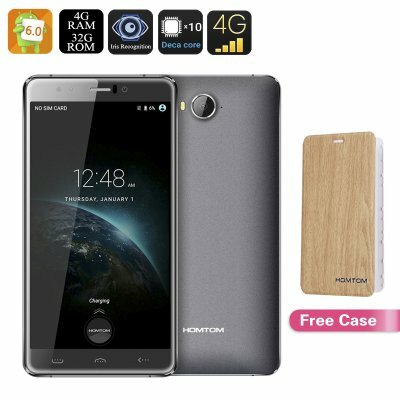 Successfully Added HOMTOM HT10 Smartphone - Iris Recognition, Deca-Core CPU, 4GB RAM, Mali-T720 GPU, 21MP Camera, 4G Dual-SIM (Black) to your Shopping Cart. Those of you who are searching for a high-end Smartphone that is capable of running all the latest features, Apps, and games at mind-boggling speeds, has a beautiful sleek design and is equipped with futuristic Iris Recognition security features – search no further. The HOMTOM HT10 has it all and is available for a remarkably affordable price. Featuring second generation Iris Recognition technology the HOMTOM HT10 brings Smartphone security to a whole new level. Unlock your Smartphone in less than one second even at night or in low light by simply looking at the device. It has never been easier to unlock your phone nor have your personal files ever been more secure. No longer do you have to struggle with fingerprint recognition nor do you have to take off your gloves during the cold winter to unlock your phone. With Iris Recognition opening your cell phone has never been easier. Equipped with an epic Deca-Core CPU running at 2.3GHz, 4GB or RAM, and a Mali-T720 GPU the HOMTOM HT10 packs some serious horsepower. With Google Play installed on your Smartphone, you have access to literally millions of Apps, all of which this Powerful device is guaranteed to handle without dropping any frames. Enjoy all your favorite movies, games, Apps and more on its 5.5 Full-HD display and take your user experience to the next level. The HOMTOM HT10 is the ultimate entertainment device. With its 2 SIM card slots, 4G connectivity, and dual IMEI number this amazing Smartphone offers you the possibility to connect to two networks at once – ensuring you that you will always be connected to the fastest data transmission speeds available and will never be out of reach for your friends and family. Insert two SIM cards in this Smartphone and you now have the perfect device to separate and organize your work and private life like never before. It's smart wake and gesture sensing features further enhance your user experience as now you can simply open any app straight from your locked screen and navigate through them without the actual need of touching your display. A built-in 21MP rear camera allows you to snap stunning pictures and record sensational footage in quality levels rarely seen before on a Smartphone. Whether you are on holiday and want to take that perfect landscape portrait or are having a fun night out with friends and want to capture one of your unforgettable moments together – this 21MP camera allows you to capture and share all your amazing memories like never before. With external memory up to 64GB, the storage of data and all your favorite pictures should never be a problem with the HOMTOM HT10. The HOMTOM HT10 smartphone comes with a 12 months warranty, brought to you by the leader in electronic devices as well as wholesale China Smartphones..
Arabic: - 5.5 بوصة الروبوت الذكي - Chinese Simplified: - 5.5 英寸的 Android 智能手机 - Czech: - 5.5 inch Android Smartphone - Dutch: - 5.5 inch Android-Smartphone - French: - Smartphone Android de 5,5 pouces - German: - 5.5 Zoll-Android-Smartphone - Hebrew: - הטלפון החכם אנדרואיד 5.5 ס מ - Hindi: - 5.5 इंच एंड्रॉयड स्मार्टफोन - Hungarian: - 5.5 hüvelykes Android okostelefon - Italian: - 5,5 pollici Smartphone Android - Japanese: - 5.5 インチの Android スマート フォン - Korean: - 5.5 인치 안 드 로이드 스마트폰 - Malay: - Telefon pintar Android 5.5 inci - Norwegian Bokmål: - 5.5 tommers Android Smartphone - Romanian: - 5,5 inch Android Smartphone - Russian: - 5.5 дюймовый Android смартфон - Spanish: - 5,5 pulgadas Android Smartphone - Thai: - สมาร์ทโฟนขนาด 5.5 นิ้ว - Turkish: - 5,5 inç Android Smartphone - Vietnamese: - 5.5 Inch Android Smartphone.